All actions performed by a Goverlan operator are audited. The default implementation records audit traces in the Windows Event Application Log, however, audits can be centralized using the Goverlan Reach Server. See Auditing of Goverlan Operator Actions. The Remote Control action benefits from additional auditing that can be queried remotely. This article describes the audit information provided and how to query it from the Goverlan Operator Console. What information is logged during a remote control session? The following information is captured during a remote control session. Where can audit information be found? The Goverlan Client is responsible for logging remote control sessions. Information is recorded in several locations for redundancy and flexibility. The proprietary log is maintained by the Goverlan Client and can be accessed from the Goverlan Reach RC UI. 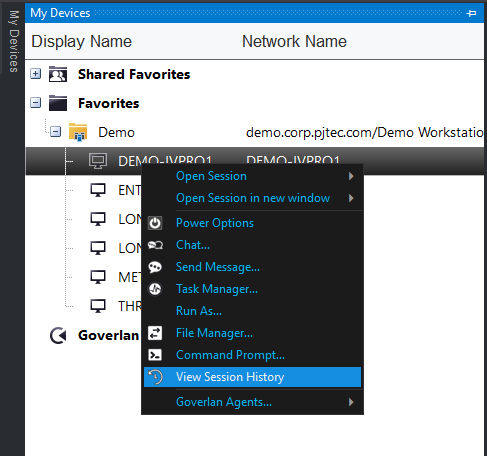 You can access the remote control session log of a machine by accessing its Goverlan Client Configuration control panel applet. Click on View Access Log. 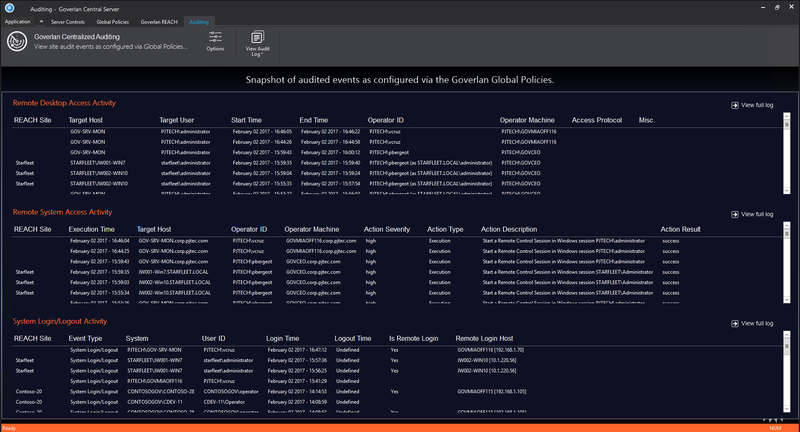 You can generate a report of Goverlan remote control session activity across multiple machines using a Goverlan Process Automation. Under Actions, configure Report > Remote Control Session History. The Goverlan Reach Server will automatically collect Remote Control logs and centrally store them. For more information, see the Goverlan Reach Server. In the Goverlan Reach Server console, click on the Audit tab on the Command Bar to view the real-time audit log. For more information on this screen see, Goverlan Auditing Services.